There has been a lot of hype lately about Agave Nectar and since I'm pretty sensitive to sugar, at first I fell for it too. It's promoted as a low glycemic, all natural alternative to sugar. It's been said that it won't give you that quick blood sugar spike like regular sugar and is a safer alternative for diabetics and healthy individuals alike. It sounds pretty good huh? Yeah, I went out and bought it too. When I realized sugar was an issue for me, I started searching for other bloggers that are also sugar free or low sugar and I found a few great websites. Still, I couldn't help but wonder, what exactly are these "alternative" sweeteners? What are they made of? For example, I read a lot about maple syrup, agave, stevia, splenda... and it really had my brain buzzing. After all that my body has been through, I really want to know EXACTLY what I'm putting into it. I always wondered why the only textbook I saved from college was my Biology book... I was a Psychology major. Now I know. I absolutely love the science of the body and specifically, the science of food as it relates to our bodily functions. I guess that's what happens when your body goes haywire and you're determined to fix it naturally! Before I go any further, let me just say first - this is not meant in any way to bash agave or alternative sweeteners (except Splenda, that stuff is poison). This is just meant to stir up your curiosity. To think more carefully about what you consume. I believe more than anything that WE are in control of our health 100% and we must take responsibility for everything that we choose to feed it! Now. Let's talk about Agave. To make Agave Nectar, the juice from the core of the plant is expressed, filtered and then heated to hydrolize the polysaccharides into simple sugars (yes folks, that means REFINED). The juice is then concentrated into a syrup like liquid that can range in color, light to dark, depending on the processing. The syrup does contain iron, calcium, potassium and magnesium, which are what contribute to the color. Raw Agave is made by using a fermentation process, rather than heat. The syrup is made up of fructose and glucose, with the fructose making up a larger portion of the ratio. The ratio varies depending on the manufacturer but the numbers I've found go all the way up to 92% fructose to 8% glucose. Now back to that little tidbit about Agave being a low glycemic food. Yes! It's true! Agave is a low glycemic food. The GI scale only measure glucose so according to that, yes, this is a better alternative to sugar. But be warned, due to the variations in fructose to glucose ratios, this may not always be the case. More importantly, what they fail to mention is that this nectar is in fact a High Fructose Syrup. Yup, that's right, I just compared Agave to High Fructose Corn Syrup. I'll let that sink in for a minute... Ok, you still with me? High Fructose sweeteners have been linked to fructose malabsorption, metabolic syndrome, decreased glucose tolerance, systemic insulin resistance, Type II Diabetes, high cholesterol, heart disease... I can go on, but I won't. You get the idea and you already know about the dangers of high fructose syrups. I just bet you didn't realize that Agave is one of them. Research even suggests that fructose actually suppresses the body's feelings of fullness. Ever had that feeling when you're eating a lot of processed foods that you're never full? Ever wonder why? 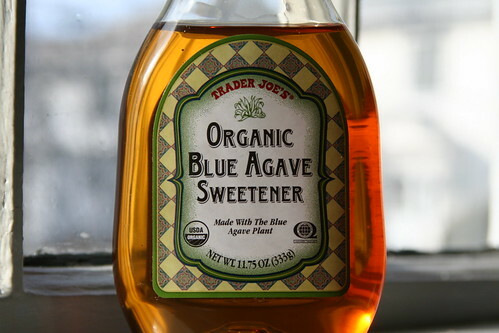 Here's the bottom line - Agave is a refined sugar, and sugars, are sugars, are sugars. Don't fall for the hype. If you are going to consume sugar, practice moderation! Try to avoid sugar as much as possible but that doesn't mean you can't indulge from time to time. The body does need sugar but the fact of the matter is, these days most of us get WAY too much of it. Most importantly, educate yourself. Know what you're eating and how it affects your body. Since most of my readers have some form of auto-immunity I can't stress this part enough! I hope this has shed a little light on Agave for you and is helpful! Great post! I learned that about agave a while ago. I actually never liked agave very much, the taste was kind of strange to me... it was just too sugary, without any character. We like to use coconut sugar! It's becoming more wide spread, hopefully soon more available for everyone to buy easily. Awesome post, Jen. I learned a lot and I appreciate all the research you conducted. I'll be changing my recent post claiming my agave sweetened waffles from "refined sugar free" to "refined cane sugar free." I think the word sugar can be confusing because it is used to describe a characteristic of a food -- like that there are sugars in agave, maple syrup, honey etc -- but more commonly, when people think of sugar they envision white table sugar. I'm sure books can be written on the subject! Again, great, easy-to-understand post! Thanks for the info. I just bought a bottle a few days ago, and wondered about it. Whoa, you're right! We're on the same wavelength here. We don't have a Trader Joe's though, so the agave I had was not organic. That's a super interesting post(PHd thesis) on agave. Had no idea what the real deal is with that stuff. I've got the exact same bottle you pictured next to the fridge. I second the appreciation of the research! I love that you highlighted the reason why so many nutritionists love agave - it's not empty cals - we do get iron, calcium, potassium, and magnesium from it. However, at the same time, that doesn't mean it's okay to drench our pancakes in it! that was a VERY interesting post! I've always wondered about it. I enjoy agave, but I'm not sure I would buy it again, just because of all the information out there these days!! Anywhoo thanks for adding me on twitter, I can tell I'll really enjoy reading your blog! I just stumbled across this blog. Thanks for the information! Thanks so much for the rundown on Agave! I have been following the no sugar diet as prescribed by David Servan-Schreiber in his book "Anticancer A new Way of Life", where he definitely says only eat natural fruits-strawberries, blueberries, and vegetables like leeks, and broccolini. And garlic, turmeric. I have been beating my cancer and feel great!